(Reuters) - Kroger Co <KR.N> has partnered with Alibaba Group Holding Ltd <BABA.N> to sell nuts, supplements and other products in China, venturing outside the United States for the first time in what is fast becoming a fierce global battle to dominate online grocery sales. Kroger will sell Simple Truth brand products on the e-commerce firm's Tmall Global virtual storefront "to meet Chinese consumers' growing demand for high-quality, organic food products," an Alibaba spokesman told Reuters on Tuesday. Shares in Kroger, the largest U.S. supermarket operator with $123 billion in 2017 sales, closed up 2.35 percent at $30.45 on news of the deal. Kroger's arrangement with Alibaba raises the stakes for rival U.S. grocery seller Walmart Inc <WMT.N>, which along with its Chinese partner JD.com Inc <JD.O>, is already fighting Alibaba for dominance in the world's second biggest economy. "E-commerce enables Kroger to quickly scale (up) to reach new customers and markets where we don't operate physical stores, starting with China," Yael Cosset, Kroger's chief digital officer, said in a statement. The latest move from the 135-year-old grocer comes as the $800 billion U.S. grocery industry wrestles Amazon.com Inc's <AMZN.O> aggressive expansion into groceries through its purchase of specialty retailer Whole Foods Market and other efforts. 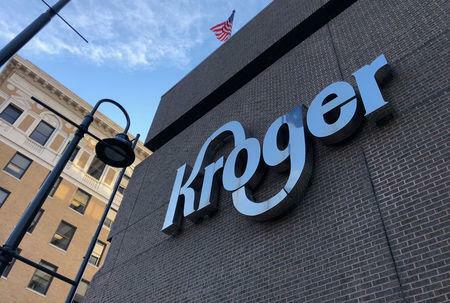 Kroger responded with its biggest strategy shift in two decades and already has unveiled a series of online initiatives. Those include inking an exclusive U.S. deal with British online grocer Ocado <OCDO.L> to build automated warehouses to prepare curbside pickup and delivery orders, and launching a beefed-up U.S. online shopping service called Kroger Ship that sends packages directly from its distribution centers. Kroger said its Simple Truth natural and organic products, which generated $2 billion in sales last year, will be sold in China beginning on Wednesday. Initial offerings include almonds and multivitamins. Walmart and JD have been tightening their alliance to counter Alibaba's dominance in China's grocery sector, where the share of online business is expected to more than double to 6.6 percent by 2020, according to research firm IGD. JD.com, the second-largest e-commerce retailer in China, serves as an online shopping platform for many Walmart stores in the country. The U.S. retailer holds a 12 percent stake in the Chinese company. Earlier this year, Walmart opened a small high-tech supermarket and partnered with JD to deliver groceries from the store, in a bid to compete with delivery from Alibaba's Hema Fresh stores. Walmart and JD also co-invested $500 million in a Chinese online grocery and delivery firm to check Alibaba, which is rapidly expanding its retail network, investing in brick-and-mortar stores and cutting deals to combine shoppers' online and offline experience.